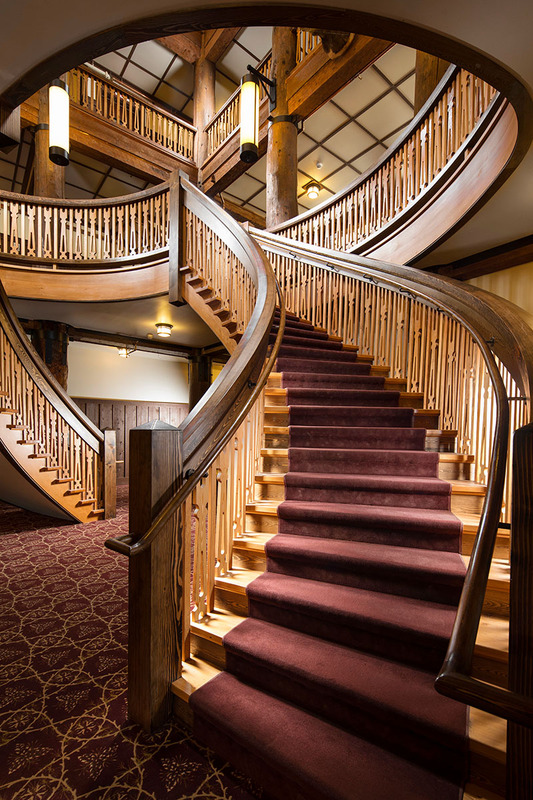 Listed on the National Trust's 11 Most Endangered Places in 1996, Many Glacier Hotel in Glacier National Park was saved by deeply committed public-private partnerships. 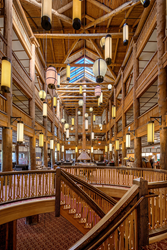 The 3-story lobby of Many Glacier Hotel, featuring warmly-restored, massive timbers and recreated Japanese lanterns. Glacier National Park’s Many Glacier Hotel is the signature landmark of a National Historic Landmark District, in a World Heritage Site within an International Peace Park. 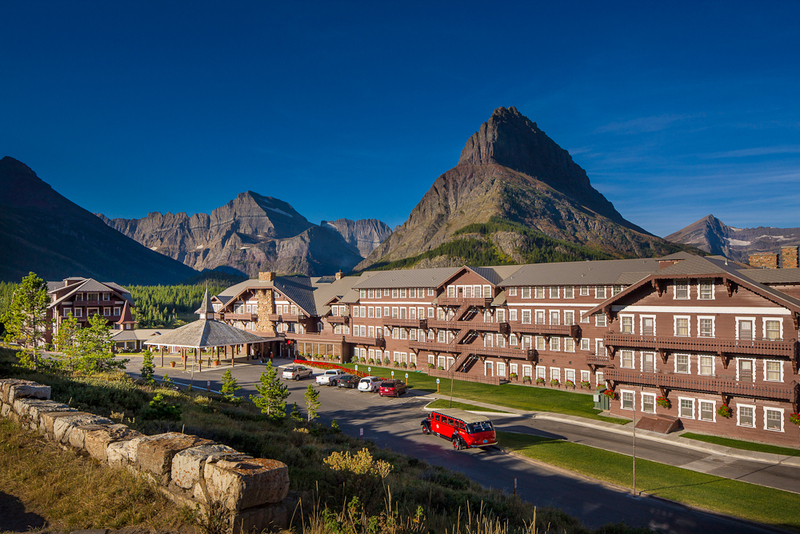 From its setting on the edge of Swiftcurrent Lake the hotel looks across miles of deeply glaciated valleys, mountains and tundra – a picture postcard of American wilderness. Built in 1917, it endured forest fires, floods and 30’ snow drifts – conditions that landed it on the National Trust's “America’s 11 Most Endangered Places” list in 1996. Replacement of the 50-year old, clogged fire sprinkler system, the system responsible for preventing a fire from spreading throughout the wood frame structure Anderson Hallas Architects, PC began rehabilitation design for the Park Service in 2004, outlining a multiyear phased interior rehabilitation of the hotel. Over thirteen years, they worked with dedicated park service staff and developed a phased approach which successfully obtained funding from private donors, Congress and the hotel’s concessioners to rehabilitate this national treasure. With a maintenance backlog of over 11 billion dollars, the National Park Service has thousands of buildings and projects competing for limited funds. For nearly two decades, the project team persevered in finding funding. Despite setbacks, the dedicated project team was able to secure multiple funding sources for Many Glacier. In the final phases, public/private partnerships provided the finishing touches on the rehabilitation, including the design and reconstruction of the Lobby’s helical stair and Asian lantern feature lighting. A nearly lost treasure - Why it matters? Each of us has a connection to a special place – whether it is our grandparents’ porch, a local gathering space, or a national park. Disappearance of these places can be profound. Preserving them can be deeply rewarding. Sites like Many Glacier define much of our nation’s history and culture. They’re places of collective memory and meaning with rich stories. 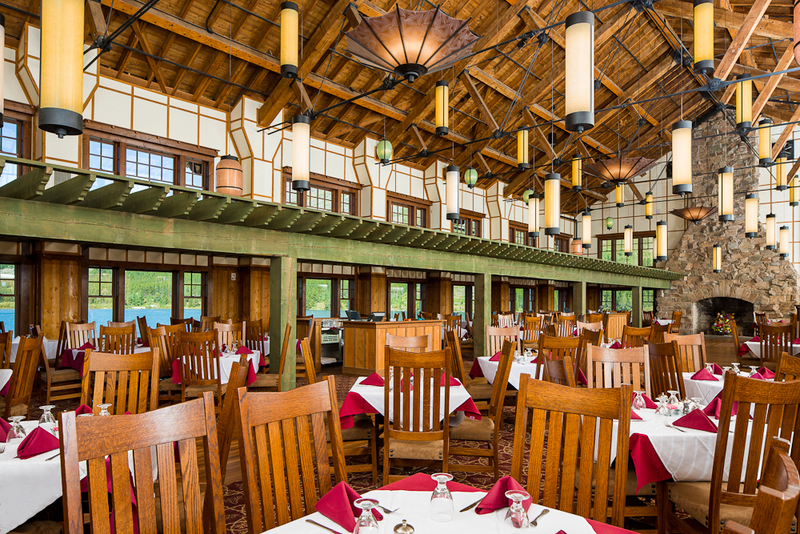 By providing both design creativity and project leadership, Anderson Hallas helped guide this inspiring rehabilitation of one of the National Park Service’s grand hotels. In September 2017, the project team gathered at Many Glacier to toast the renewed glory of this National Landmark, Many Glacier Hotel.